Wouldn’t it be nice to have a guide to help choose the proper foods? We have a Vegan Nutrition Guide which will help you make good food choices or decisions. The guide discusses Good Fats vs. Bad Fats: Which Commonly Eaten Fats Fuel The Body And Which Ones Destroy It. How many calories in your diet should come from fats? Do different body types require different amounts of fat? Which fats do we need to get from food? Why is there so much disagreement about these questions? Does eating oil cause lipemia (decreased blood flow)? Are the endothelial cells lining our blood vessels damaged when we eat oil? Does oil become rancid when extracted from its source, or only when heated above its smoke point? Well here’s great news. 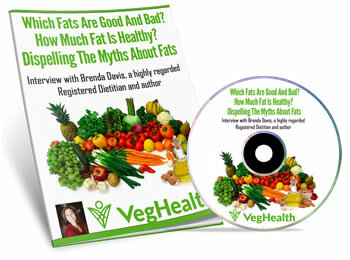 In a recent interview with The VegHealth Institute, author Brenda Davis dispelled the myths about fats and oils. Brenda is a Registered Dietitian and co-author of 7 best-selling books including Becoming Vegetarian, Becoming Vegan, and Becoming Raw. Over 2.3 million copies of her books are in print in 8 languages. Normally, only the Institute’s paying students get access to this interview. However, I’ve arranged complimentary access for you… no strings attached. It is FREE. You can listen to the recording (or download it). You can download the interview or listen by clicking on the image below! Hurry to get the vegan nutrition guide now, this offer will not last long!